It doesn’t get much better than a hot, sudsy soak in the tub. This may or may not include a glass of wine 😉 But now science is catching up with what you’ve always known: baths have the power to relax body and mind. Research from the Complementary Therapies in Medicine journal found that soaking in warm water daily for eight weeks is more effective at easing anxiety than prescription drugs! Want to up your game? Try adding a fancypants body scrub to your stress-busting arsenal. Not only are salt scrubs easy to make and cost-effective, but the self-care ritual itself it very relaxing. Plus, you can often stir one together with whatever is handy in your pantry. Here’s a simple but highly satisfying recipe to get you started. It is uplifting, energising, detoxifying and relaxing all at once. Virgin Coconut Oil: Is there anything coconut oil can’t do? It is one of those miraculous plant foods and in this case, coconut oil is drenching your skin with medium-chain fatty acids. These rare fatty acids keep the skin hydrated, smooth, and supple. Lemon Zest: Not only does lemon zest smell amazing and promote energy, it also benefits the skin. High concentrations of its essential oil (limonene), flavonoids, and citric acid help enhance the clarity, glow, and softness of your skin. The plant acids in this amazing fruit work hard to cleanse, brighten, and stimulate cellular turnover. Note: Conventional lemon zest can contain a lot of pesticide residue, so try for organic or wash thoroughly. 1. Combine the vanilla seeds, the remaining pod and the lemon zest with the salt in your jar. Mix thoroughly with a fork until well combined. Pop the lid on and let it infuse for two-seven days, giving it a shake now and then. Optional: If you have dried flower petals, crush them up very finely with a pestle and mortar and add them to the container. 2. In a glass mixing bowl, mash/whisk your coconut oil until it is light and creamy. Add in the sea salt mixture, discarding the empty vanilla pod, and mix by hand until well combined. You should have a thick, creamy paste. Optional: Add 3-5 drops of lemon essential oil for more citrus scent. 3. Spoon the mixture back into your clean glass container and tightly close the lid. Your body scrub is ready to enjoy in the shower or bath. Simply scoop out your desired amount and exfoliate damp skin from the feet up. Body scrubs can be uncomfortable for those with very sensitive skin, so it is usually best to concentrate on especially dry areas like elbows, hands, knees, ankles, and feet. Follow up with a body butter or lotion to lock in moisture. 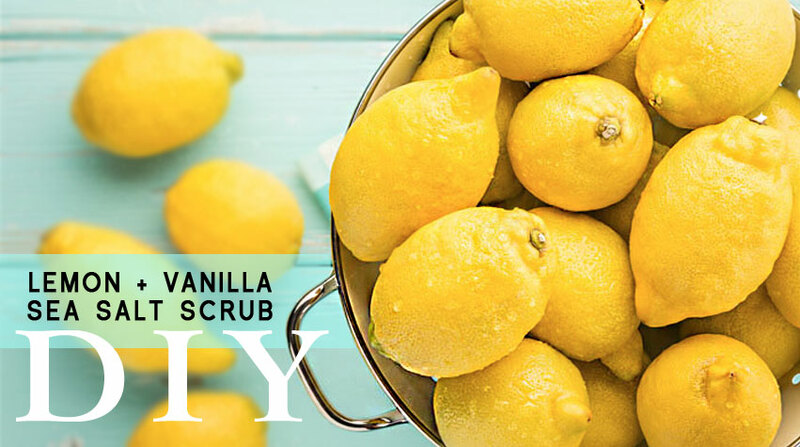 Store your jar of Lemon & Vanilla Sea Salt Scrub in a cool, dark place, out of direct sunlight. Avoid getting water in the container. Use within 3 months. I love this idea, Melissa and yes, I pretty much have everything in my kitchen right now! I try to have a relaxing bath every Sunday morning – it’s part of my ‘me time’ ritual, so I’ll definitely be giving this recipe a go! You could use olive oil instead of coconut oil. This will make a looser mixture, which is also nice. I’m not sure exactly how much you will need. Just add it a little at a time until it’s loose enough to scoop out, but not too drippy. If your last scrub turned into a hard lump, that may have been because there wasn’t enough oil in the first place or the room temperature was cool. Coconut oil can be rock hard if it’s very cold, and it will melt at 24C. If you make anything with a “hard fat”, like coconut oil, shea butter, mango butter, etc., it might need to be warmed up a little if it’s too hard. You can do this by holding it to your skin/in your hand until it softens or by placing your jar into a pot of hot (not boiling) water.